The winner of last week's Great Wednesday Compare (Lady Macbeth VERSUS Atticus Finch), with a final score of 7-0 was Atticus Finch. There was no hand wringing over last week's vote apparently. A shut out. 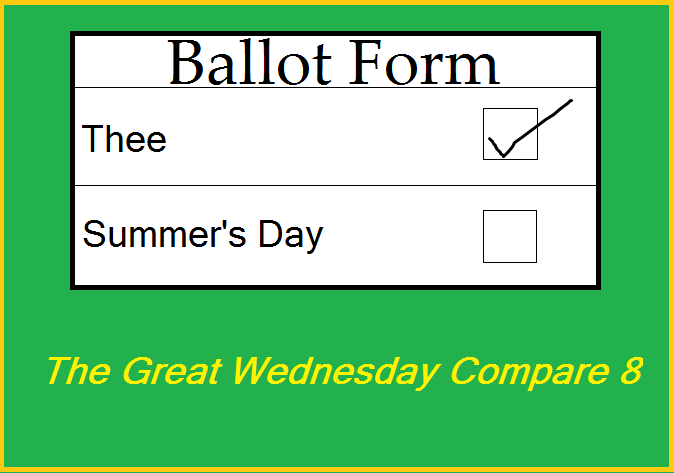 But at least she had a good run here at the Great Wednesday Compares. Definitely one of Shakespeare's characters. I'm probably a but biased towards her as Macbeth was the only play I've ever done (though I did have a part in the Laramie Project, which unfortunately never got off the ground). While I was a lowly, nameless murdered a friend of mine played Lady Macbeth and stole the show. Some of Shakespeare's characters can be pretty flat, but Lady Macbeth has such a complexity, depth and growth. Okay, so she wasn't that nice, but come on, a great character nonetheless. Moving on to the next contender, I've brought out the big guns. However, I'm giving you lots of time to mull it over. Three weeks in fact, while I'm on vacation. But I'm going to have to vote for Anne Shirley. While it would leave a huge gap in the book world, I can imagine a world where To Kill a Mockingbird didn't exist; whereas I can't imagine not being able to pull out one of the Anne books when I'm feeling a bit blue. I was acquainted with Atticus long before Anne-with-an-E. Sorry, Red. Oops...now she's really mad! Oh. This is hard. Two of my favourite characters...think I'm going to have to go with Anne though. Great choices this week. I don't think I can predict a winner. I'll vote for Anne. Clearly, I must go with Anne or risk expulsion from my province. Luckily, I think I would have voted that way anyway. Why couldn't you have let Atticus have a bit of a run before putting Anne up? such a meanie! While I do like Atticus Finch, I have to go with Anne Shirley. Part of this is there are more Anne Shirley books so there has been a longer relationship. Or maybe because I am a redhead. Somebody's got to have Atticus' back! It shall be me. After pondering this for a while, I realize my Atticus-love is all mixed up with Gregory Peck-love. I'll have to go with Anne as well. I do admire Atticus. But I love Anne Shirley. I'm the same as Niranjana, I think it's Gregory Peck I love more than Atticus Finch. You are all nuts, swayed by years of CBC indoctrination. In March I read and reviewed The Canterbury Trail by Angie Abdou. This brings my total of Canadian books to five!